In order to understand the effects of external drivers such as climate change, sea level rise, and anthropogenic alterations of the landscape, we need to document their patterns over time and space. This is similar to Q1 from GCE-II, and much of the proposed work is a direct continuation of those efforts, but we are adding studies of land use change, shoreline modification, and Native American use of the area to enhance our understanding of the human drivers of change. Our goals are to track long-term changes in climate (average conditions and extreme events like storms) and human actions (in the watershed and adjacent uplands), and to evaluate the effects of climate and human drivers on domain boundary conditions (riverine input, runoff and infiltration from adjacent uplands, sea surface height). We collect long-term measurements of A) climate, water chemistry, oceanic exchange, and B) human activities on the landscape in order to document how boundary conditions that affect the domain vary over time. In order to understand the effects of external drivers such as climate change, sea level rise, and anthro pogenic alterations of the landscape, we need to document their patterns over time and space. This is similar to Q1 from GCE-II, and much of the proposed work is a direct continuation of those efforts, but we are adding studies of land use change, shoreline modification, and Native American use of the area to enhance our understanding of the human drivers of change. Our goals are to track long-term changes in climate (average conditions and extreme events like storms) and human actions (in the wat ershed and adjacent uplands), and to evaluate the effects of climate and human drivers on domain boundary conditions (riverine input, runoff and infiltration from adjacent uplands, sea surface height). Description: We are installing an eddy covariance flux tower with an LTER level 3 weather station in a Spartina-dominated marsh in the Duplin River to study fluxes of heat, water and carbon. A sonic anemometer and a closed-path gas analyzer (Li-7200) measure the 3D wind vector, air temperature, and concentrations of CO2 and H2O at 10-20 Hz. Soil heat fluxes are measured with heat flux plates, an averaging thermocouple and a soil water content reflectometer. Other instrumentation measures humidity, vertical temperature variations, atmospheric pressure, rainfall, and marsh water level. Up- and downward looking radiative sensors measure shortwave (solar), long wave and photosynthetically active (PAR) radiation. A StarDot NetCam SC digital camera takes RGB and IR pictures every 30 min to get high frequency phenology data (Richardson et al. 2007). Use of the flux tower is discussed in Area 3A. Description: We are synthesizing 12 y of nutrient data from the main stem of the Altamaha and its 3 main tributaries. These data will serve as the basis for loading curves for inorganic (NO3, NH4, PO4) and organic (DOC, DON) nutrients to the domain and for characterizing differences among sub-watersheds. We hypothesize that the level of nutrient loading in each tributary is a function of nutrient inputs to the watershed, but that temporal dynamics are a function of streamflow. For GCE-III we will focus on the 10 main stem of the Altamaha, as it integrates tributary flows and represents the actual input to the estuary, and reduce the sampling frequency from weekly to monthly. However, we will expand our analyses to include measurements of DIC, alkalinity, and pH, and will also characterize DOM composition and source. These data will inform our C budget (Area 4), and allow us to track long-term changes in acidity. Description: We will instrument the mouth of the Duplin River with a horizontal ADCP to track water exchange between the Duplin River and Doboy Sound. These high frequency measurements will provide calibration and validation data for the more detailed hydrodynamic model of the Duplin (Area 2). Description: We will deploy acoustic Doppler current profilers (ADCPs) with a vertical array of conductivity-temperature-depth (CTD) sensors at the mouths of the 3 Sounds and at the 10-m isobath during fall (low river discharge, downwelling favorable conditions) and spring (high river discharge, upwelling favorable conditions) to measure exchange with the coastal ocean. Cruises to deploy and retrieve these instruments (see UNOLS ship-time request) will also include synoptic sampling for nutrients and carbon constituents and measure the spatial extent of the Altamaha River plume in the coastal ocean. These focused studies will enable us to better characterize exchange between the GCE domain and the continental shelf, and will provide data needed to calibrate the hydrodynamic model (Area 2). Description: The Maps and Locals project has produced a detailed analysis of land use change in our domain (Runfola & Pontius in review). We are building on this, in partnership with Georgia Sea Grant. The "Listening Project", modeled after an ongoing project at the Coweeta LTER, involves semistructured interviews with coastal residents designed to elicit information on their experiences of land use change and how it has affected coastal habitats. These data will enhance our understanding of human perceptions of the causes and consequences of long-term change in the region. Description: The ecosystem services project is evaluating market and non-market values of natural resources in McIntosh Co. (Fig. 9). These data will help us to determine how different development scenarios or predicted changes in habitat (Area 4) will affect ecosystem services such as C storage. Description: Several data sets are available that provide information on human modification of the shoreline within the GCE domain. These include GIS maps (Alexander) showing the locations of sea walls and other types of shoreline armoring (Fig. 9), and studies by the UGA Marine Extension Service of the locations and status of septic tanks in McIntosh Co. We also have historic and archaeological information on long-term changes in shoreline location due to changes in sea level and on shoreline accretion and erosion. We will incorporate these data sets into the GCE GIS. These coverages will inform experimental site selection (Area 3c) and scenario development (Area 4). Description: Humans have been living on and physically modifying the coastal landscape for over 5,000 y. Studies conducted in GCE-II suggest that humans increased the elevation of upland areas adjacent to some marshes by over 1 m by adding shell deposits (Thompson et al. in press), and that these deposits affected the composition of high marsh vegetation (Guo & Pennings in review). In GCE-III we will conduct core transects and use a combination of optically stimulated luminescence dates, radiocarbon dates, and relative dates from buried artifacts to evaluate both the timing of human occupation and formation of new marsh habitats, both of which will be useful for hindcasting “pre-development” scenarios (Area 4). We will also conduct surveys at archaeological shell test pits and investigate correlations between shell presence (and other drivers) and current marsh vegetation patterns. We hypothesize that human activities have a) modified the marsh/upland border, affecting the susceptibility of these areas to sea level rise, and b) modified the high marsh plant community. Activities: An eddy covariance flux tower was installed in the Duplin River in summer 2013. It has an open path infrared gas analyzer for CO2/H2O, a sonic anemometer, sensors for air temperature, humidity, PAR, total solar and long wave radiation, soil heat flux plates and soil thermocouples, a rain gauge, and a camera for phenology studies. Activities: GCE operates an eddy covariance tower in the Duplin River that measures CO2 and H2O fluxes along with atmospheric, soil and water properties. Since the wind patterns change seasonally, we added a 2nd LICOR unit facing the other direction. We also added a pressure transducer to measure water levels in the adjacent creek. Activities: GCE continues to operate an eddy covariance tower in the Duplin River that measures CO2 and H2O fluxes along with atmospheric, soil and water properties. We have established a data processing routine that involves signal processing (de-spiking, planar fit, detrending) and 30-minute averaging. Activities: GCE continues to operate an eddy covariance tower in the Duplin River that measures CO2 and H2O fluxes along with atmospheric, soil and water properties. We have established a data processing routine that involves signal processing (de¬spiking, planar fit, de¬trending) and 30¬minute averaging. The flux tower has had some major repairs and services to various sensors (LICOR, PAR, pressure transducer, Anemometer cable) and communication devices (modem replacement) during this last year. Activities: GCE continues to operate an eddy covariance tower in the Duplin River that measures CO2 and H2O fluxes along with atmospheric, soil and water properties. The flux tower sustained damage during Hurricane Matthew (10/16) and needed repairs and services to various sensors and communication devices. This past year we added an additional downwelling PAR sensor and pressure transducer, but we are experiencing ongoing challenges maintaining the CO2 sensor and anemometer. Results: Install and maintain an eddy covariance flux tower Nahrawi et al. (submitted) used flux tower data to evaluate how the ratio between water level and vegetation height affects atmospheric CO2 exchange, with greatest reduction during high spring tides. Activities: A series of meteorological stations are used to characterize the GCE domain (Fig. 1). The station at Marsh Landing, which is operated in collaboration with SINERR, serves as our primary LTER meteorological station for ClimDB. Referenced sea level data, offshore wind forcing, and river discharge are also tracked. Results: Sheldon and Burd (2013) examined variability in freshwater delivery (precipitation and discharge) to the Altamaha River estuary in relation to indices for several climate signals and found complex, seasonally alternating patterns. Understanding how climate patterns affect precipitation and river discharge will help elucidate how the estuarine ecosystem may respond to climate changes. Activities: A series of meteorological stations are used to characterize the GCE domain (Fig. 1 ). The station at Marsh Landing serves as our primary station for ClimDB. This year we deployed a ceilometer (purchased with Supplemental equipment funds) and a sodar to evaluate boundary layer conditions as an aid to interpretation of flux tower data. Results: Initial results from the ceilometer show complicated patterns of atmospheric mixing and how the boundary layer can be influenced by the presence of fog (Fig . 1), which may have implications for estimating surface CO2 flux. Activities: A series of meteorological stations are used to characterize the GCE domain (Activities Fig. 1). The station at Marsh Landing serves as our primary station for ClimDB. We continue to operate a ceilometer (purchased with Supplemental equipment funds) and a sodar to evaluate boundary layer conditions as an aid to interpretation of flux tower data. Results: Ceilometer and sodar data were used to characterize nocturnal low-level jets. We have found that periods with low-level jets are associated with smaller jet speed, weaker turbulence, stronger atmospheric stability, and smaller turbulent kinetic energy and fluxes. These results are being written up for publication. Activities: A series of meteorological stations are used to characterize the GCE domain (Fig. 1). The station at Marsh Landing serves as our primary station for ClimDB. Results: We developed a Fourier spectral technique that can accommodate data gaps that result from biofouling of our instruments (Fig 1). This provides us with continuous data for use in hydrodynamic models. Activities: A series of meteorological stations are used to characterize the GCE domain (Fig. 1). The station at Marsh Landing serves as our primary station for ClimDB. In October 2016 Hurricane Matthew passed through Georgia, causing a significant storm surge (Fig. 2). Results: Collect ongoing information on climate and oceanographic conditions Zhang et al. (submitted) conducted a spectral analysis of turbulence over the salt marsh based on meteorological data from the flux tower, an acoustic profiler and a ceilometer. They found evidence that upward shear above jet cores inhibits downward movement of larger eddies, and suggest that shearsheltering is different over water than over land. Activities: We collect monthly samples of the river water entering the GCE domain via the Altamaha River for analysis of dissolved inorganic nutrients, DIC, alkalinity and pH. Results: Schaefer (2014) evaluated N input and export in the 7 subwatersheds of the Altamaha River and found that cumulative upstream population density was an excellent predictor of both NO3 and total N concentrations and loads, and that there was little evidence for N processing during transit. Takagi et al. (submitted) analyzed long-term GCE observations of nutrients in the main tributaries and also found that dissolved inorganic N loads are driven by human population density. Taken together, these results suggest that N derived from human wastewater in the upper portion of the watershed is the primary contributor of in-stream N in the lower river. Activities: We collect monthly samples of the river water entering the GCE domain via the Altamaha River for analysis of dissolved inorganic nutrients, and biweekly samples of DIC, alkalinity and pH. Results: DIC and TA concentrations in water entering the Altamaha River estuary are well fit by a negative power function with flow (Fig 2.) Dilution is evident at lower flows, but the more constant concentrations at higher flows suggest that additional sources become entrained from the watershed. Activities: We collect monthly samples of the river water entering the GCE domain via the Altamaha River for analysis of dissolved inorganic nutrients, and semimonthly samples for DIC and alkalinity. Results: Collect samples of Altamaha River water entering the domain Takagi et al. (2017) conducted a longterm analysis of water quality in the tributaries of the Altamaha River (Fig. 1), exploring their relationships with discharge and anthropogenic influences. Plans: Instruments and mooring equipment is being built or acquired in order to be ready for deployment in year 2. Permits for submerged moorings are also in preparation. Activities: We carried out 3 research cruises on the RV Savannah during which we deployed acoustic Doppler current profilers with CTD sensors. The data from these moorings will be used to help understand exchange with the coastal ocean and to inform our hydrodynamic model of the region. We also sampled nutrients and C to characterize fluxes through the system. Activities: The GCE led 4 oceanographic cruises on the R/V Savannah in 2014, and also participated in an additional 3 cruises in the GCE domain (led by J.T. Hollibaugh for a separate NSF project). Instruments were deployed within each of the three sounds in the GCE domain and data are being used along with ship based measurements to provide information on along and cross shelf flows during each season. In addition, cruises involved measurements of inorganic C (pCO2, pH, DIC, and Total Alkalinity); organic carbon (DOC, POC, CDOM, C composition); nutrients (DIN); DNA; chlorophyll; and sediment (texture, composition). A final cruise is scheduled for 2016. Activities: The GCE conducted an oceanographic cruise in spring 2016 (led by R. Castelao) to deploy surface drifters at the mouth of the Altamaha River during a time of peak discharge. This was the final cruise scheduled for the project. Results: Observational data collected from moored ADCPs reveals net outflow to the coastal ocean (Fig 3). Comparisons are currently underway with the GCE domain model to investigate the physical forces leading to these residual flows. Activities: Trajectories of surface drifters were used to provide information on nearsurface circulation over the shelf for a study of the export of terrestriallyderived material (Medeiros et al. 2017). 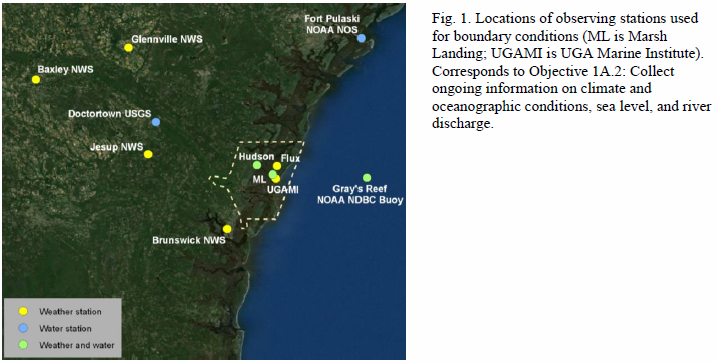 Results: Measure exchange between the mouths of the estuaries and the coastal ocean EOF analysis of cross shelf flow suggests that the primary mode of variability is related to along channel winds and Ekman dynamics, and the second mode is related to Altamaha River discharge. Activities: We have acquired an H-ADCP to deploy at the mouth of the Duplin River. Plans: The horizontal ADCP instrument needs to be mounted on a new piling along the Duplin with cabling to shore for power and data acquisition. We are currently scouting the area to identify a location that will not interfere with boating traffic near Marsh Landing. Activities: We have had difficulty identifying a location for deployment of a horizontal ADCP that does not interfere with boat traffic. Plans: We will survey the channel area near Marsh Landing to find an appropriate place to drive a new piling for the ADCP, and then proceed with permitting and deployment. Activities: We have concluded that we cannot attach a horizontal ADCP to an existing structure as originally planned and will instead need to install a piling, which requires permits from both the State DNR and the USACE. However, we have started to evaluate exchange with the FVCOM model (see Objective 2C1). Plans: We will proceed with permitting and deployment. Activities: Final permits to install an H¬ADCP in the Duplin River have been obtained from GA DNR and the US ACE. Deployment is scheduled for November 2016. Activities: The HADCP was successfully deployed in the Duplin River (Fig. 3) and has been collecting data since November 2016. Results: Measure exchange between the Duplin River and Doboy Sound HADCP data reveal times of significant residual outflow from the Duplin River as well as short periods of strong inflow (indicative of times of strong inundation) (Fig. 2). Activities: We conducted in depth interviews with 20 individuals who have resided in McIntosh County for a minimum of 10 yearsas part of the cross-site “maps and locals” project, supported by Sea Grant and the National Estuarine Research Reserve. Results: The final report from this study “Listening to and learning from local ecological knowledge: A social science pilot study in McIntosh County, GA” summarizes information about the primary environmental concerns of interviewees. These included changes in freshwater, which many attributed to ditching and draining of swamplands and linked to effects on the crab fishery. Activities: This objective was completed in yr 1. We are collaborating with N. Heynan, who runs the CWT LTER Listening project, to use this work as the basis for a GCE Listening project. Activities: This objective was completed in yr 1. Activities: We evaluated the potential effects of future development in McIntosh County by combining a cost of community services analysis with an ecosystem service valuation approach. Funding for this study was split with Georgia Sea Grant. Results: In a study of the value of resources in McIntosh County, Schmidt et al. (submitted) found that 1) forested wetlands generate relatively little revenue to either private landowners or in taxes to the county from extractive uses, but have very high value relative other land cover types in the provision of ecosystem services, 2) forest lands contribute much more in revenue than they receive in services, whereas residential properties cost more in services than they generate in revenue, and 3) significant gains in ecosystem service preservation, hazard reduction, and in lower costs to the county in municipal services could be achieved by restricting new development from within the 500 year floodplain. Activities: This objective was completed in yr 1 (see Schmidt et al. 2014). Activities: GCE took the lead on the development of a cross-site database on the extent and types of coastal armoring structures present at coastal LTER sites, which will be hosted the GCE LTER website. We also used newly-available Lidar data to develop a high-resolution hammock inventory for the state of GA.
Activities: Data from an archeological survey documenting human occupation of hammocks around Sapelo Island and a radiocarbon database for the entire Georgia coast were both uploaded to the GCE catalog. Activities: We developed an armored shoreline GIS database based on 2013 imagery. This is being compared to a similar 2006 database to examine rates of armoring and preferential areas of armoring in the GCE domain. Activities: We used our GIS database to assess the rate of shoreline armoring in the GCE domain between 2006 and 2013. Results: The number of shoreline armoring structures in McIntosh County, GA (the GCE domain) increased by 34% between 2006 and 2013, with a corresponding increase in length of 18%. Most of these were bulkheads and revetments. Activities: We are in the process of updating our GIS database to include shoreline armoring in the GCE domain based on 2017 imagery. Activities: This past summer we investigated Kenan Field, the largest archaeological site with continuous Native American occupation on Sapelo Island (4,000 y). Results: DePratter and Thompson (2013) evaluated changes in the shoreline position over the past 4000 years for the northern Georgia Coast. 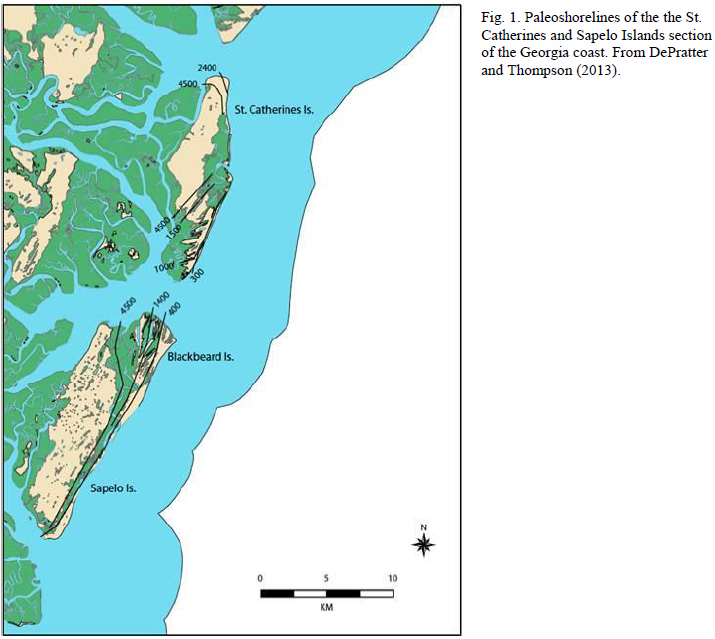 They documented large-scale shifts in shoreline positions that account for the timing of current landforms on the Georgia coast, and evaluated this information in the context of archaeology, ecology and geology. Activities: We continued our investigations of human population growth in the domain (both Native Americans and historic EuroAmericans) in the context of ecological change. Results: We see a large-scale decline in the radiocarbon record for specific types of human settlements at around 3800 BP. We are working on a paper documenting this shift, which we believe relates to large scale environmental change. Activities: We continued our investigations of human population growth in the domain (both Native Americans and historic EuroAmericans) in the context of ecological change. This past year we excavated materials from 3800 BP to provide insight into an observed large-scale decline in the radiocarbon record that occurred at that time. We are also using dendrochronology as the basis for paleoclimate reconstruction of sea level rise and drought events. Results: Turck and Thompson (2016) found that human occupation of the GA coast varied in response to changes in sea level. In deltaic areas (the Altamaha River Estuary corridor) there was continuous Late Archaic occupation and intensive shellfishing as sea levels dropped, and in non-deltaic areas (most of the GCE domain) there were subsistence changes and population movement. Activities: We examined shell size and morphology of eastern oysters in samples dating from the Late Archaic, Late Woodland and Late Mississippian periods to evaluate resource changes over time. Results: Assess changes in Native American economic systems over time Lulewicz et al. (2017) found that the shells of Eastern oysters decreased in size through the Late Woodland and into the Late Mississippian periods, which they suggest resulted from decreases in sea level. principal investigator(s): Daniela Di Iorio, Dorset Hurley, Wade M. Sheldon Jr.
Addes, D. 2014. Presentation: Listening to and learning from local ecological knowledge: A social science pilot study in McIntosh County, GA. Exploring the Values of the Coast. Social Coast Forum 2014, February 18-20, 2014, Charleston, South Carolina. DePratter, C. and Thompson, V.D. 2013. Past Shorelines of the Georgia Coast. Pages 145-167 in: Life Among the Tides: Recent Archaeology on the Georgia Bight. Anthropological Papers of the American Museum of Natural History, New York. Schaefer, S.C. 2014. Controls on nitrogen inputs, loads, and in-stream concentrations in the Altamaha River, Georgia, and beyond. Ph.D. Dissertation. University of Georgia, Athens, GA.
Sheldon, J.E. and Alber, M. 2006. The calculation of estuarine turnover times using freshwater fraction and tidal prism models: a critical evaluation. Estuaries and Coasts. 29(1):133-146. Sheldon, J.E. and Alber, M. 2002. A comparison of residence time calculations using simple compartment models of the Altamaha River estuary, Georgia. Estuaries. 25(6B):1304-1317. Sheldon, J.E. and Alber, M. 2005. Comparing Transport Times Through Salinity Zones in the Ogeechee and Altamaha River Estuaries Using SqueezeBox. In: Hatcher, K.J. (editor). Proceedings of the 2005 Georgia Water Resources Conference. Institute of Ecology, University of Georgia, Athens, Georgia. Sheldon, J.E. and Alber, M. 2003. Simulating material movement through the lower Altamaha River Estuary using a 1-D box model. Hatcher, K.J. (editor). Proceedings of the 2003 Georgia Water Resources Conference. Institute of Ecology, University of Georgia, Athens, Georgia. Blanton, J.O., Alber, M. and Sheldon, J.E. 2001. Salinity response of the Satilla River Estuary to seasonal changes in freshwater discharge. Pages 619-622 in: Hatcher, K.J. (editor). Proceedings of the 2001 Georgia Water Resources Conference. Institute of Ecology, University of Georgia, Athens, Georgia. Dugan, J., Alber, M., Alexander, C.R. Jr., Byers, J., Emery, K., Gehman, A., Lawson, S. and McLenaghan, N.A. 2015. Poster: A conceptual model for predicting the ecological effects of coastal armoring in soft-sediment environments. Coastal and Estuarine Research Federation Biennial Meeting, August 30 - September 2, 2015, Estes Park, CO.
Dugan, J., Alber, M., Alexander, C.R. Jr., Byers, J., Emery, K., Gehman, A., Lawson, S. and McLenaghan, N.A. 2015. Poster: A conceptual model for predicting the ecological effects of coastal armoring in soft-sediment environments. Coastal and Estuarine Research Federation Biennial Meeting, November 8-12, 2015, Portland, OR. Gehman, A., McLenaghan, N.A., Byers, J., Alexander, C.R. Jr., Pennings, S.C. and Alber, M. 2015. Poster: Effects of development and shoreline armoring on the high marsh ecosystem. Benthic Society Ecology Meeting 2015, March 4-7, 2015, Quebec City, CN. Sheldon, J.E. and Burd, A.B. 2009. Presentation: An In-depth Look at Alternating Effects of Climate Signals on Freshwater Delivery to Coastal Georgia, U.S.A. Hydrologic Prediction in Estuaries and Coastal Ecosystems. CERF 2009: Estuaries and Coasts in a Changing World, November 1-5, 2009, Portland, OR. Sheldon, J.E. and Burd, A.B. 2007. Poster: Detecting climate signals in river discharge and precipitation data for the central Georgia coast. 2007 AERS/SEERS Meeting, March 15-17, 2007, Pine Knoll Shores, NC. Alber, M. and Sheldon, J.E. 2006. Calculating estuary turnover times during non-steady-state conditions using freshwater fraction techniques. Southeastern Estuarine Research Society meeting, Ponte Vedra Beach, Florida. Alber, M. and Sheldon, J.E. 2006. Presentation: Simple tools for assessing coastal systems: can we get there from here? Coastal Observing Systems Workshop, LTER All Scientists Meeting, September 20-24, 2006, Estes Park Colorado. Sheldon, J.E. and Alber, M. 2005. Poster: New and improved: Modeling mixing time scales in the Altamaha River estuary. GCE-LTER 2005 Annual Meeting. GCE-LTER, Feb. 11-12, 2005, Athens, Georgia. Sheldon, J.E. and Alber, M. 2005. Presentation: Beyond whole-estuary flushing times: Using transport times through salinity zones to explain chlorophyll patterns in the Altamaha River estuary (Georgia, USA). Estuarine Interactions: biological-physical feedbacks and adaptations. 2005 Estuarine Research Federation Meeting. October 16-20, 2005, Norfolk, Virginia. Sheldon, J.E. and Alber, M. 2004. Presentation: SqueezeBox: Flow-scaled 1-D box models for estuary residence time estimates. NOS Workshop on Residence/Flushing Times in Bays and Estuaries. National Oceanic and Atmospheric Administration, June 8-9, 2004, Silver Spring, Maryland. Sheldon, J.E. and Alber, M. 2004. Presentation: SqueezeBox: Flow-scaled 1-D box models for estuary residence time estimates. Spring 2004 meeting. Southeastern Estuarine Research Society (SEERS), October 14-16, 2004, Wilmington, North Carolina. Sheldon, J.E. and Alber, M. 2003. Poster: Modeling mixing time scales and transport of dissolved substances in the Altamaha River estuary. 2003 LTER All Scientist's Meeting, "Embarking on a Decade of Synthesis". LTER, Sept. 18-21, 2003, Seattle, Washington. Sheldon, J.E. and Alber, M. 2003. Presentation: The equivalence of estuarine turnover times calculated using fraction of freshwater and tidal prism models. 2003 Estuarine Research Federation meeting, Sept. 14-18, 2003, Seattle, WA. Sheldon, J.E. and Alber, M. 2001. Poster: Any way you slice it: A comparison of residence time calculations using simple compartment models of the Altamaha River estuary. ERF 2001: An Estuarine Odyssey (16th Biennial Conference of the Estuarine Research Federation). Freshwater Inflow: Science, Policy and Management. Estuarine Research Federation, Nov. 4-8, 2001, St. Pete Beach, Florida. Alber, M. and Sheldon, J.E. 2000. Presentation: Residence times in the Altamaha River Estuary: a progress report. Southeastern Estuarine Research Society Meeting. Southeastern Estuarine Research Society, Oct 01, 2000, Tampa, Florida. Sheldon, W.M. Jr. 2006. Mining and Integrating Data from ClimDB and USGS using the GCE Data Toolbox. In: DataBits: An electronic newsletter for Information Managers: Spring 2006. Long Term Ecological Research Network, Albuquerque, NM.